Hungary's Viktor Orbán Sweeps To Re-Election, Securing Populist Party Majority : The Two-Way Orbán, 54, handily secured his third consecutive term on an anti-migration platform in an election with a record-high turnout. His right-wing Fidesz party is poised to regain majority in parliament. Hungary's prime minister Viktor Orban carries his ballot at a polling station in Budapest on Sunday, before winning a third consecutive term. Hungarian Prime Minister Viktor Orbán and his populist Fidesz party easily swept to victory on Sunday in a parliamentary election that saw the highest turnout of voters in more than a decade. It will be the third successive term for Orbán, who is the longest-serving prime minister in post-communist Hungary; it's the 54-year-old's fourth term overall. His party is projected to regain its two-thirds majority in the 199-seat parliament. Budapest voter Katalin Andrássy said she cast her ballot for Fidesz because she believed the right-wing party and its leader offer Hungary the best protection against Muslim migrants and pressure from Brussels — the main issues Orbán campaigned on. "I voted for stability and the process that is already underway, and I would like for this process to continue positively with the team that has managed to do positive things," she said. Fidesz' formerly far-right rival, Jobbik, came in a distant second. Its chairman, Gábor Vona, told reporters at a late night news conference that he was resigning. "We would have liked for this high turnout to yield a different result, but the people decided this way," he said. Some Hungarian analysts had predicted the high turnout of voters would benefit the opposition. Those candidates did appear do better in bigger cities like Budapest, but Fidesz appeared to dominate races in the rest of the country. Many polling stations around Hungary remained open for several hours after the 7 p.m. CEST closing time to accommodate voters standing in long lines. The prime minister and his party also likely benefited from the mail-in ballots of 378,000 of new voters who are ethnically Hungarian, but live abroad. Critics say the current government actively recruited and provided them with citizenship and also allowed them to mail in their votes, which citizens who move abroad from Hungary are not allowed to do. International observers from the OSCE Office for Democratic Institutions and Human Rights (ODIHR) have scheduled a press conference on Monday to talk about some of their findings on the Hungarian elections. 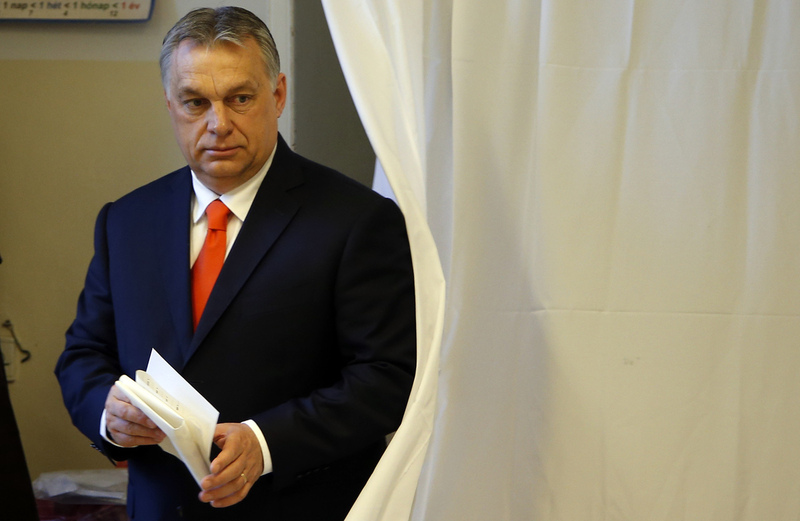 Some right-wing conservatives in Hungary who used to support Fidesz have soured on Orbán. One such supporter-turned-critic is Péter Márki-Zay, an independent mayor who two months ago beat the Fidesz candidate in the party's southern stronghold of Hódmezővásárhely. Orbán "created a system where he practically cannot be removed from power," Márki-Zay said. "As in every authoritarian leader, you know, after time, he just surrounded himself with people who supported him and didn't dare to criticize him. So he lost touch with reality." That's not how the prime minister sees it. "Our homeland, Hungary is not yet where we would like it to be," he told supporters on Sunday night. "But it has set out on the way it has chosen for itself. We'll go all the way on this road together." The sweeping election results will likely embolden the prime minister in his battles with the EU leadership over its attempts to better integrate the 28-country bloc, as well as any plans it has regarding refugees. Hungarian government spokesman Zoltán Kovács told NPR the new government also plans to exert more control over civil society. Earlier this year, the cabinet submitted draft measures to the Hungarian parliament aimed at banning NGOs deemed a security risk or that support immigration, while also imposing a 25 percent tax on foreign donations to those groups who help migrants. "Because of the election campaign ... there was no time actually to go through the proposal," Kovács said. "But that's going to be the first issue, the first topic on which the new parliament" votes.